I still don’t get how Groupon has this many brand new Nexus 7 (2013) tablets lying around their warehouses, but they do, even after all these months. We are talking about a tablet of Google’s that is almost two years old and hasn’t been sold by Google in I don’t even know how long. We wrote up a similar deal from Groupon two months ago, yet here we are in mid-March, telling you about the same discounted tablet of Google’s. But hey, the tablet is still solid for an Android tablet! Why not buy one? 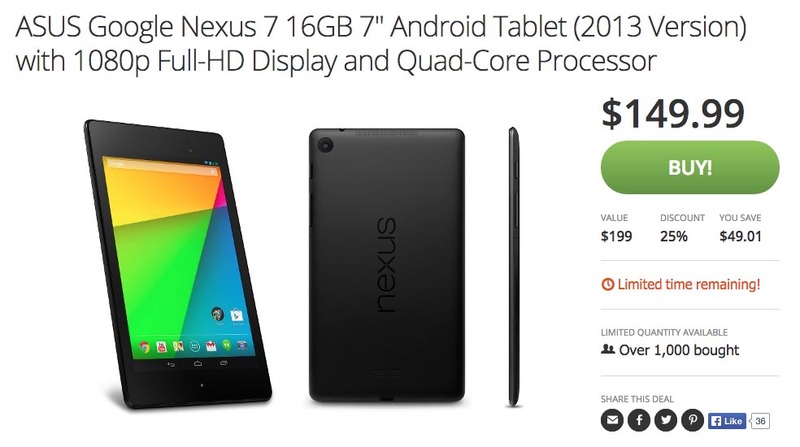 The deal is this – a brand new 16GB Nexus 7 (2013) for just $149. This tablet originally sold for $229, so that’s a decent $80 discount. It’s already running Lollipop, has a solid high-res display, and is compact enough that you may even be able to toss one in your JNCOs at Marilyn Manson shows. Still need an Android tablet, but don’t want to dent the bank account? Here you go.